Wing span: 3/4 - 1 inch (2 - 2.5 cm). 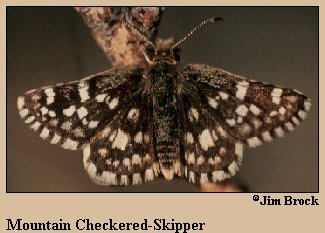 Identification: Upperside is dark grayish brown with 2 broken, irregular rows of white spots across both wings. Underside is similar to upperside, but duller. White hindwing fringe is streaked with black to the edge of the fringe. Male does not have a costal fold. Life history: Males patrol but usually perch in gullies all day to watch for receptive females. Eggs are laid singly on leaves or flowers of the host plants. Caterpillars make a webbed shelter in which they rest and feed. Flight: One brood from April-June. Caterpillar hosts: Various Potentilla species in the rose family (Rosaceae). Adult food: Flower nectar and dung. Habitat: High mountain clearings from 8000 to 10,500 feet in elevation. Range: Southern Colorado to central Arizona and southern New Mexico. Conservation: Monitor populations and habitats and determine conservation needs. Management needs: Take management action if necessary.